You are what you eat… and what your dinner eats, too! As any angler will tell you, fresh fish is the best fish (Fig. 1)! Even non-anglers would insist that grilled wahoo, dockside yellowfin sashimi, or fried dolphinfish fingers are best when fresh from the sea. Knowing your fish is wild-caught means there are no questions about the quality of the fillet, or the fish’s diet – right? Fig. 2: A sugar bag originating from the Dominican Republic. 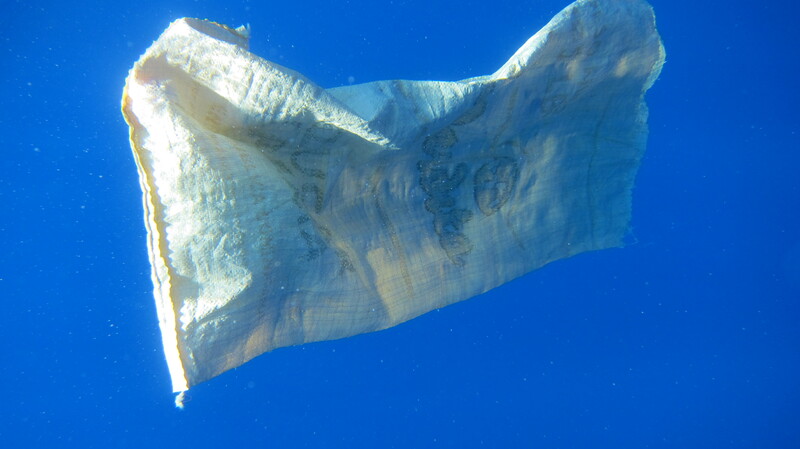 Within a few years this bag will break up into tiny microplastics, easily available for accidental consumption by marine fishes. Each year, between 8-12 million tons of plastic end up in the world’s oceans, ranging in size from large pieces of floating trash or small (< 5mm) microplastics barely visible to the naked eye (Fig. 2). Some of this debris may result in the entanglement and death of marine mammals, or can be ingested by birds, sea turtles, and fish with severe health consequences. Even more concerning is that plastic debris acts as a magnet for persistent organic pollutants (POPs) such as PCBs or DDT – chemicals known to disrupt hormones or have carcinogenic effects in humans and animals. 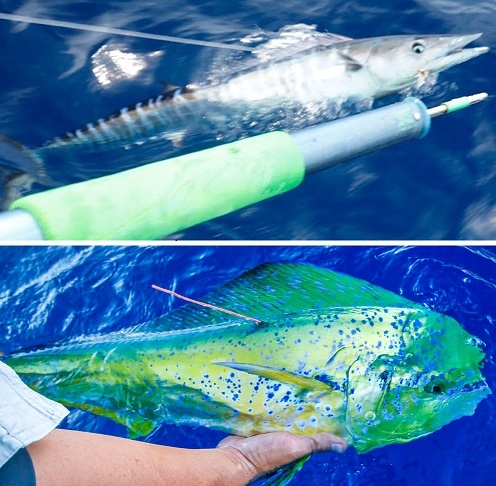 Thus, identifying whether plastic debris is consumed by recreationally and commercially important fish species should be of concern to any angler or sushi-lover. Fig. 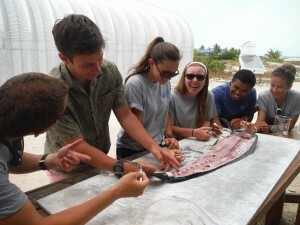 3: Island School students remove the stomach from a dolphinfish in preparation for a stomach dissection. CEI researcher Zach Zuckerman, along with 6 Island School students, are investigating how marine debris – particularly plastic – is affecting the marine food web of The Bahamas. Zuckerman and his team have collected over 100 dolphinfish, wahoo, and yellowfin tuna carcasses from anglers at Cape Eleuthera Resort and Marina and Davis Harbour Marina, both located near CEI’s campus on South Eleuthera. The location at which each fish is captured is recorded, and the stomachs removed at CEI’s wetlab to be dissected in search of plastic debris. To identify microplastics, the team runs the contents of each fish’s stomach through a sieve, or a series of increasingly smaller screens, to separate prey and debris by size (Fig. 3). Fig. 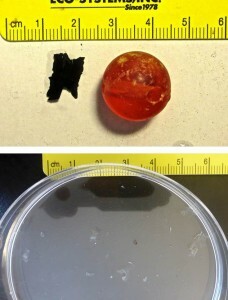 4: This large hair bead and piece of trash bag were discovered in a dolphinfish and wahoo (top), while these 14 small pieces of clear plastic film were discovered after sieving the stomach contents of a single yellowfin tuna. Preliminary results indicate that 19% of wahoo, 23% of dolphinfish, and 20% of yellowfin tuna captured in Eleuthera’s waters contain plastic in their stomachs. Some of this is easily identifiable by eye such as pieces of plastic bag! Most of the debris, though, is less than 5mm in size and identifiable only through the sieving process such as the 14 small pieces of clear plastic found in a single yellowfin tuna (Fig. 4)!. These preliminary results are quite startling; past gut content analysis of fish harvested near the Pacific Garbage Patch suggests much lower occurrences of plastic ingestion by recreational species, with only 2% of dolphinfish and no yellowfin tuna having been found with plastic in their stomachs. These researchers, though, only searched the gut by eye and did not sieve the stomach contents. Many anglers claim to have never seen plastic inside a fish, yet it would seem that most have never looked quite close enough! Please follow this research as we increase our sample size, add new recreational species to the study, and quantify concentrations of free-floating plastic around Eleuthera by sampling the Exuma Sound with a plastic trawl (blog coming soon). Contact zachzuckerman@ceibahamas.org with questions or to support our research efforts.